Hayes’ Nate Griggs (35) puts up a contested layup during the first half of Tuesday’s non-league showdown against visiting Mifflin. 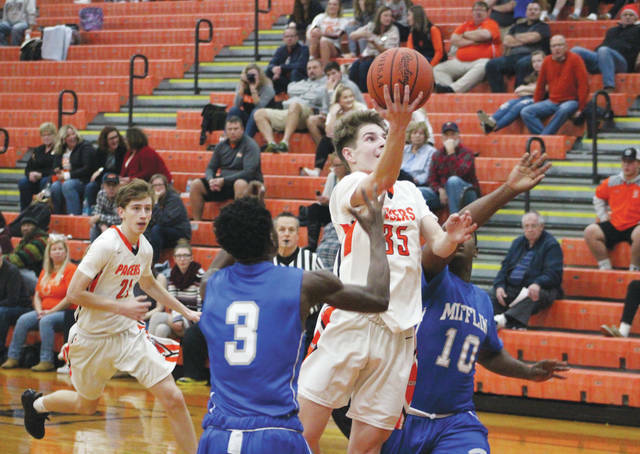 The Delaware Hayes boys basketball team had a one-point lead late, but Daveonn Logan hit back-to-back threes to put his team ahead to stay as Mifflin escaped with a 50-46 non-league win Tuesday in Delaware. The Pacers (0-3) had a chance to tie things at 49, but Paul Frentsos’ three rimmed out with 22 seconds left. It goes as a loss in the record book, but one Hayes coach Jordan Blackburn said his team can build on. “I felt like we got back to our identity tonight (in terms of) how we play on the defensive end … fighting, scraping, clawing and finding a way to get stops,” he said. “Our practice yesterday was fantastic and it felt like it carried over to today. Terin Kinsway led Hayes with 17 points while Nate Griggs finished with 14. Itika Wynn and Logan paced the Punchers with 12 points apiece. The duo connected on a combined seven three-pointers. Big Walnut opened league play with a lopsided win, rolling past visiting Groveport 67-17 Tuesday night in Sunbury. The Golden Eagles (4-0, 1-0 OCC) led by six, 14-8, after the first quarter, but clamped down on the defensive end the rest of the way. They allowed just four points the entire second half. Big Walnut led 27-13 at the break and outscored Groveport 40-4 in the second half to account for the final margin. Nine different players scored for the Eagles, led by Avery Schone’s 15-point performance. Other standouts included Katie Cochran (14 points) and Erin Boehm (10 points). Abby Facemyer was also solid in the win, chipping in seven points of her own. Also: Westerville North 51, Olentangy Orange 40.